The 9-to-5 way of life isn’t necessarily the norm these days. Having flexibility and the freedom to pick and choose projects is luring millions away from the traditional office setup that once dominated American work culture. One report from Emergent Research and Intuit predicts that by 2020, 40 percent of U.S. workers will fall into the freelance camp. But some have taken it further than others. Within this larger trend is a smaller one: the rise of digital nomads, or independent workers who are trading permanent addresses for life on the road. Leveraging the array of options for working remotely and staying connected virtually, they’re setting up shop all over the globe—and building their careers in the process. We caught up with some to find out how they earn, spend and save for the future, while soaking up the nomadic lifestyle. “In 2012, my wife Lindsey and I were living in Colorado Springs, working in marketing and as a finance director, respectively. The only problem? Being chained to desk jobs wasn’t helping us check off a key item on our pre-baby bucket lists: traveling the world. In order to pull that off, we knew we had to revamp our finances and maximize our $80,000 household income. Preparing to take off: We started saving for what we hoped would be a two-year adventure on the road. We trimmed our spending, eliminating splurges. And when one of our cars was totalled in an accident, we downsized to one vehicle and banked the $7,000 insurance check. By spring 2014, we’d paid off $17,000 of student and auto loans and upped our savings to $45,000. We earmarked $15,000 for emergencies, which left us with $30,000 to live on for the next two years. At this point, my employer and I parted ways, though Lindsey’s company agreed to let her work part-time while traveling. Life and money on the road: Since our travels began, we’ve lived everywhere from a condo in Thailand to a camper van in New Zealand, and we’re currently at a campground in Vermont. We usually explore each new locale for two to three months, and spend about $1,500 a month on food, lodging and entertainment. We sometimes offset those costs by picking up odd jobs wherever we are. For example, this October, we may work at a fair, selling apple turnovers for a friend we met hiking. Altogether, we’re bringing in around $30,000 annually. That’s a lot less than what we made in Colorado, but our cost of living is much cheaper. As a result, we never feel stressed about money—even after spending the last of our travel fund—and our quality of life is significantly better. We even have enough wiggle room that we’ve started saving up for a baby. It may be unconventional, but we’ve met tons of digital-nomad families with kids. Our goal is to save $20,000 before we start trying, and we’re already one-fifth of the way there. 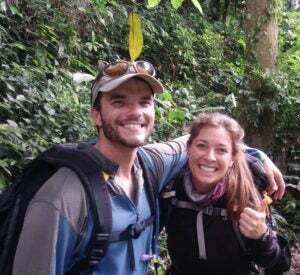 Their advice for aspiring nomads: Sit down and make an actionable plan before you quit your 9-to-5 job. Wiping out your savings or going into debt is no way to finance your dreams. Instead, start saving and be patient.